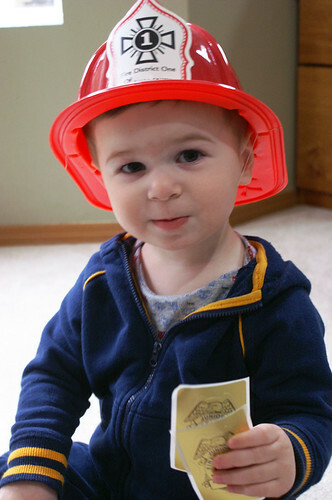 A Tender Heart » Blog Archive » How many firefighters does it take to rescue a toddler? How many firefighters does it take to rescue a toddler? Two to provide the tools. Two to saw the doorknob off a locked closet. 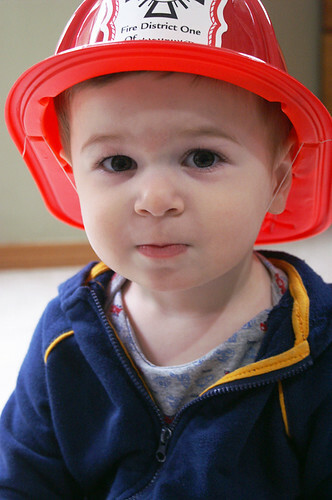 One to give the rescued toddler a plastic firefighter hat. And another to give him junior firefighter badge stickers. If you ever buy a house that (very strangely) has door knobs on random doors around the house…..
….. That can only be unlocked by a key. And the previous owner doesn’t give you that key. Before you have to call 9-1-1. Of the five doors in our house like this, Bubbers picked the safest one to suddenly learn to lock himself behind. My blessed son waited to lock himself in my closet with all my clothes until after I was fully dressed for the day. He remained completely calm as we waited and talked through the door about the firefighters who were coming to help him open the door. The firefighters were extremely understanding, helpful and sweet toward Bubbers. Bubbers loves to play peek-a-boo in my hanging shirts. So when I told him to go hide in my clothes before the firefighter started to saw, he knew what I was talking about and did it. So he was safe. To pick up five new non-key lock door knobs at Lowe’s. p.s. The last time I called 9-1-1 was almost exactly one year ago. And it also involved a locked door. Oh. My. Goodness. I’m so glad he is alright. And you too, mama. Those kinds of things are not easy on mommies. And that is a mercy indeed that you were fully dressed! Oh man! That would have been a little scary for him if he wasn’t hiding in your clothes while they were sawing! I’m glad everything is all right. That’s cute they gave him an adorable hat!!! I love that. What a story to tell!!! I’m glad he was in a safe room and that you had a chance to have clothes on!!! i had to smile at this story … poor bubbers! but he scored a handsome had out of the ordeal! and hooray for new knobs! Oh my gosh! What a crazy day! glad he wasn’t scared and got out safe! Like Mother like son! I guess this would be your fault then? I would have never thought to call the fire department. I probably would have called a lock smith and he would have been stuck for a longer period of time AND I would have had to dish out $75 to get him free. I’m glad that you have such a great attitude and were able to see the good things (tender mercies) in this whole experience. Glad your little man is ok! Oh my goodness! So glad everything worked out fine. Sounds like Bubbers was very mature through the entire experience. Glad you didn’t go into labor! 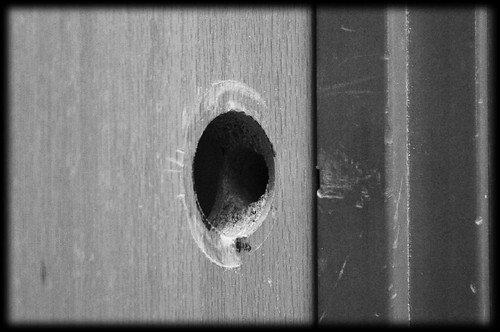 Once when I was watching your sister’s children, Sammy (about 2) locked himself in a bathroom made of particle board in the basement. I had to get a hammer and take apart the side of the bathroom to get him out! You presented your challenging experience so beautifully. Wow, I think I will remember your advice! What an exciting day that must have been! Looks like Bubbers scored with the hat! 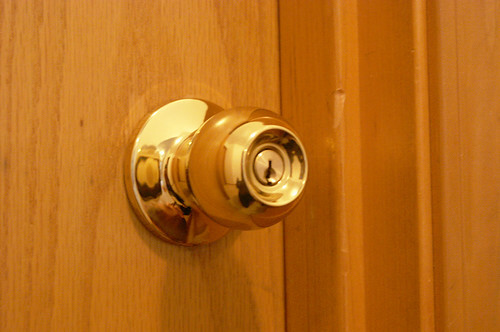 I put door knob covers on the locking side of the knob (plastic safety door knob cover) when my kids were little. My neighbor did have an incident where she went out on her deck and her little girl locked the door behind her. I sent my son over to crawl through the doggie door to unlock it. He was 6 at the time and could fit through. Another idea. Put Duct Tape over the door knob locks or door knob covers so he can’t lock them. Okay, so I looked at the brand of my jogging stroller and I’m pretty sure it’s a Graco Expedition. It says Expedition on the seats but I can’t see anywhere any other name. So it might be Graco but might not. I got it at Babies R Us. Hope that helps and happy stroller shopping! P.S. I’m glad your little guy survived his closet experience (and you too)! Thank you, Cara! I think my friend’s is an Expedition, too, though I don’t think it’s Graco… Do multiple brands have Expeditions?? Oh no! Bet that made for an interesting day…probably more interesting than you’d planned for though! :) But like you said, at least you were already dressed! :D He looks so adorable in that hat! So glad he was okay and not too scared. I wasn’t home that morning, otherwise we definitely would have come over to see if everything was ok, had we seen a big fire truck in our neighbor’s driveway! Glad all is well!